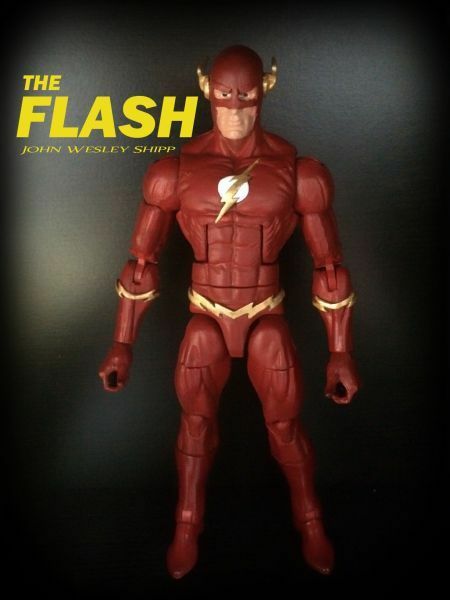 John Wesley Shipp Flash figure finally a reality?!? It was the show that introduced me to the scarlet Speedster! Although only a one-season wonder that aired during my senior year in High School, It came at a time when Comic book films and Television shows were getting a larger degree of respect. Sadly, there was very little merchandise to support it. you could buy a few posters here and there, and a One issue Comic book special with an episode guide. Long after the series was off the air, the pilot movie and a few episodes were released on home video. Now in all this, the only toy to speak of was a repackaged figure from Toybiz's abysmal DC Super Heroes Line that came off as a knock off Super Powers collection but without the quality. (or quantity. Fans still petitioned for the series to be released and eventually it was. (In fact, if I recall correctly, a commemorative soundtrack actually came out first). Then it was announced that a new Flash TV series would be released and that John Wesley Shipp would play a supporting role. (Many people argued he should be Jay Garrick, and while that did eventually happen, I was glad it didn't occur until almost two years in, and that his primary role was that of Barry's Father Henry Allen. 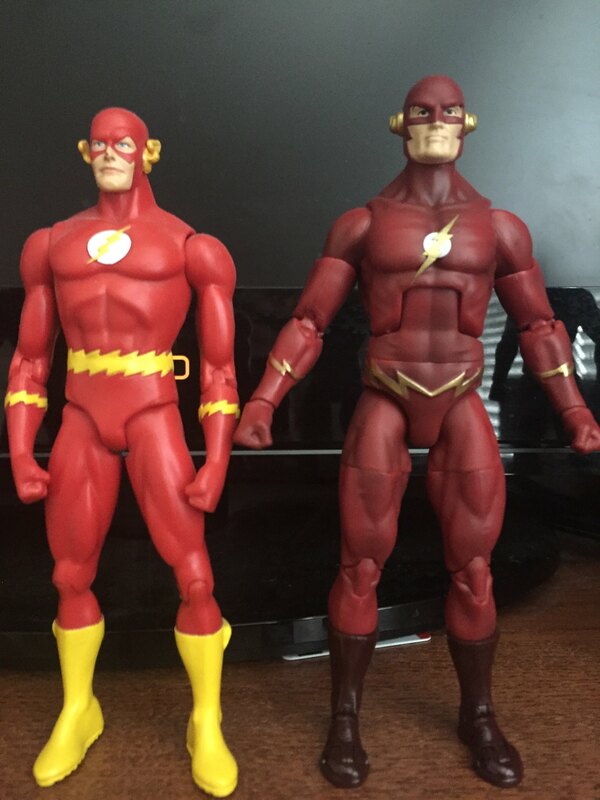 When the first figures began to hit the shelves from DC Collectibles and Mattel respectively, I started mentioning how great it would be to have a classic 90's TV Barry to stand next to his younger counterpart. When NECA toys released first a Michael Keaton Batman in 7" I started bombarding their facebook pages of Mr. Shipp's flash in the hopes that since DC Collectibles wouldn't do the old series, (they seemed more focused on the newer series) they'd give NECA the go-ahead. Sadly nothing came of it and NECa lost the right to even do a few special "Surprise Holiday Season" 7" DC movie/TV figures. 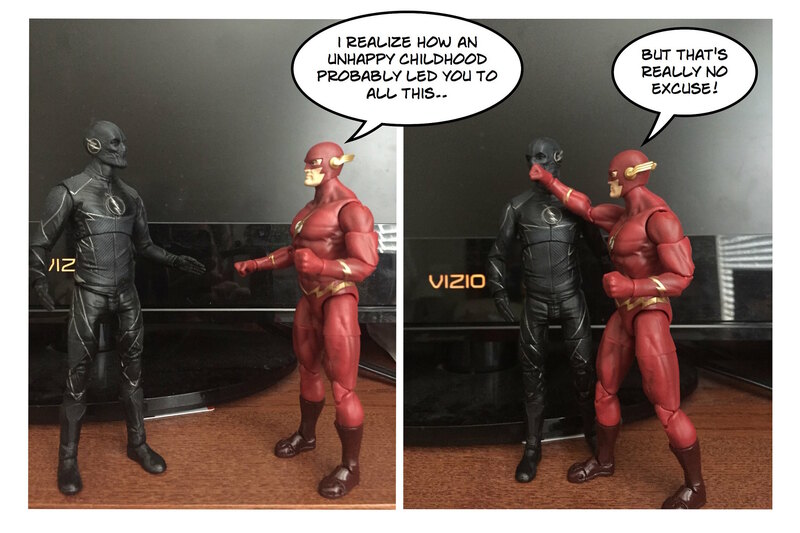 In the last few months we've even seen DC Collectibles fall of the TV figure bandwagon. Legends of Tomorrow's Atom was delayed nearly nine months from his original release date last spring to this past fall. 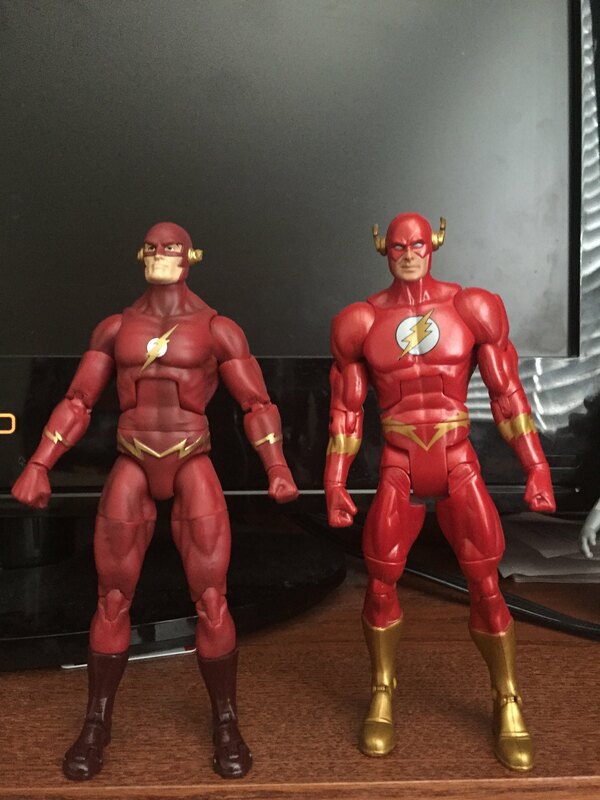 The only Flash figures we got was a repackaged Single figure of Flash from Last year's Flash/Arrow two-pack and a Kid Flash. (There has yet been no sign of a Season 5 Arrow figure. Mattel on the other hand has been busy with DCEU movie figures Man of Steel, Batman v Superman, Suicide Squad, Wonder Woman and Justice League. 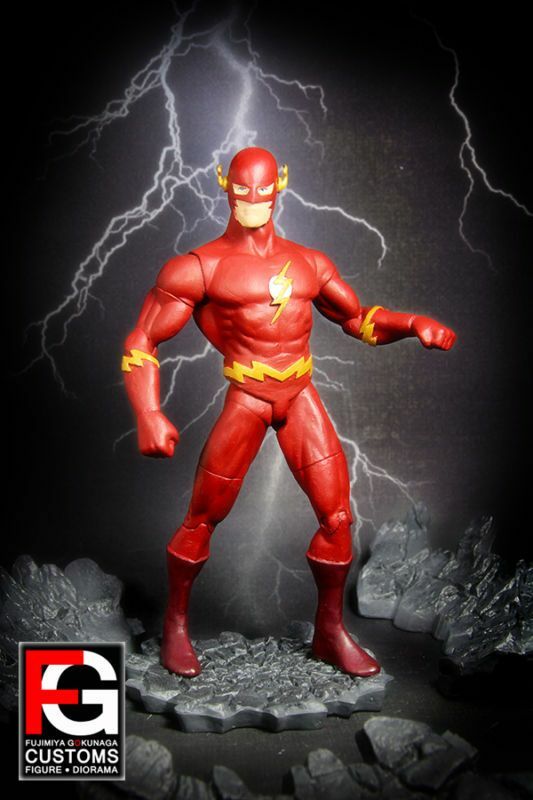 in addition they've done a few figures of the flash TV series Flash from Seasons 1 and 2, Reverse flash, Zoom and Jay Garrick. But not the real Jay played by JWS. instead, they gave us the Teddy Sears Jay Garrick Imposter.. This images has popped up online showing what appears to be new 6" figures from Mattel featuring Lynda Carter Wonder Woman, Val Kilmer Batman & John Wesley Shipp Flash. 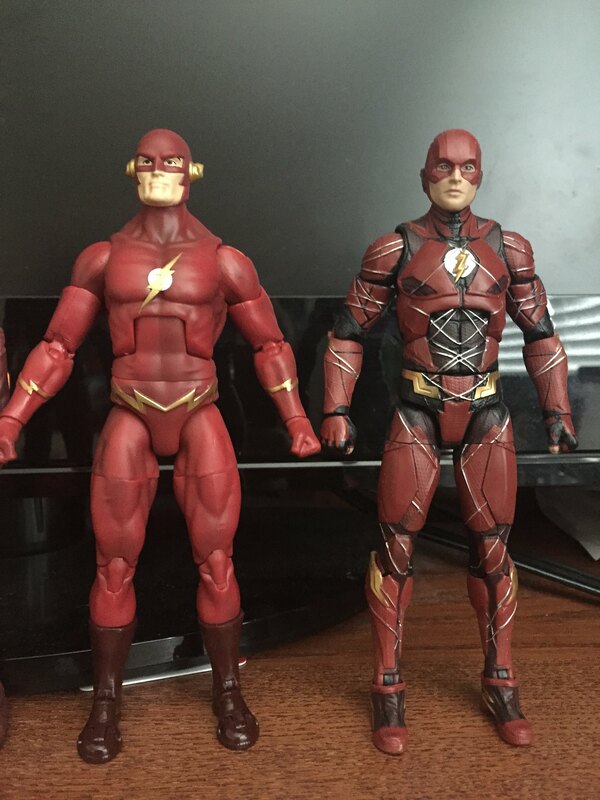 According to They're Action Figures, these will be part of a new $30 line called World's Greatest. The figures will feature alternate hands, accessories and display bases. They state the UPC will be 887961605495. They also say these figures will be released next month. We will try and get better images and more details on this as they become available. 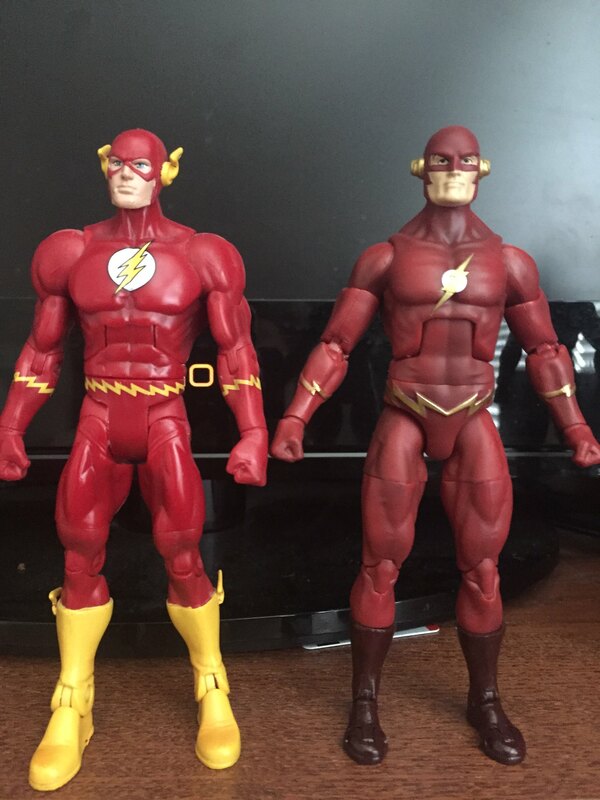 Still, my mind is reeling at finally having an actual John Wesley Shipp Flash figure in hand! I can't wait to see who's in the next wave! I would love to have one ... Golddragon71 and that's would make me a happy man! I'm going to ask my nephew to get me one ... he's gets generous discounts! 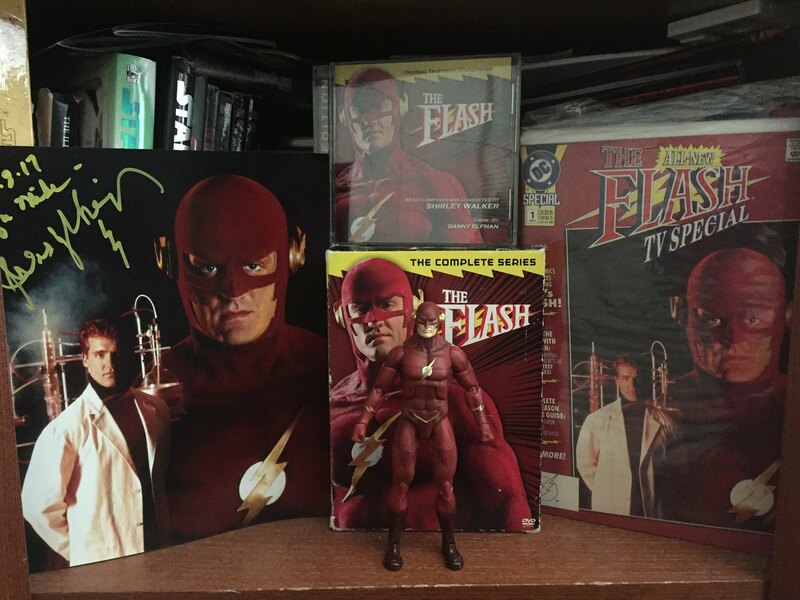 Thanks to a lucky find on Ebay I managed to get my hands on the Multiverse Signature 1990's TV FLASH. 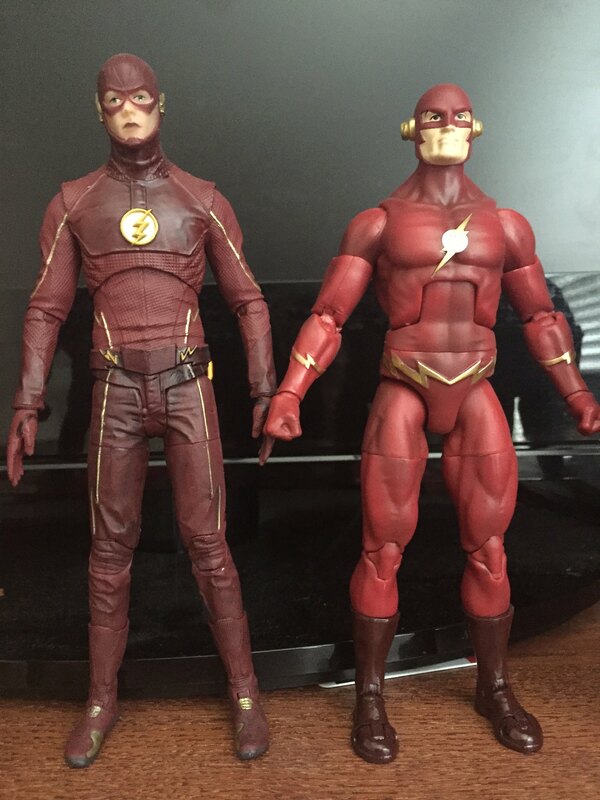 It exceeds expectations and while it's a tiny bit shorter than the DC Collectibles DCTV Flash, It still stands tall enough to match some of the other Incarnations. Now I'm looking forward to getting the next figures in the series. I like the toe-hinge articulation. I wish more Spider-Man figures had that for convincing crouching poses.